Where to start with this absolute beauty of a book? The prose? The characters? The romance? Condie's writing skills moved me to feel things I didn't think were possible to feel. 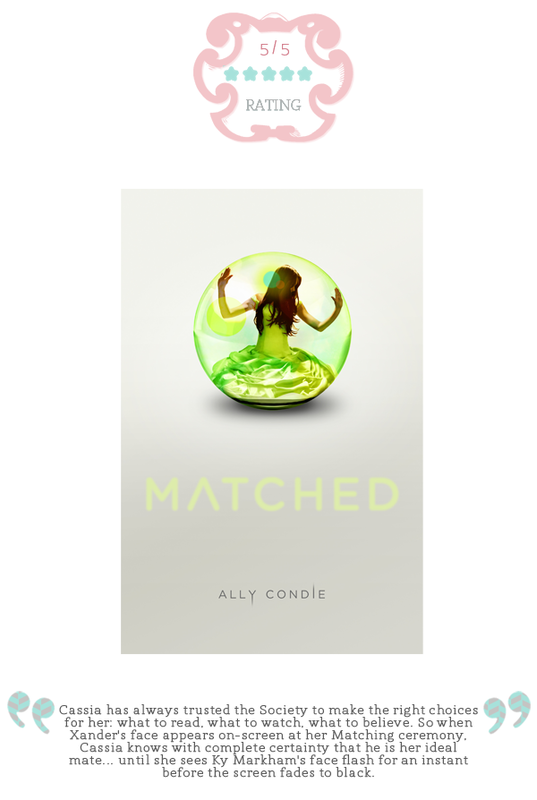 I can't be sure what it is exactly about 'Matched' that has touched me so deeply but I urge any YA Fiction fan to get a hold of this little gem as quickly as possible because in my personal opinion, this novel is without flaws. Cassia is nervously waiting to attend the ceremony that all teenagers approaching adulthood will go through when being officially 'matched' to their life partners. The matches are chosen especially by the society based on what they consider to be the best matches for the perfect future reproduction of children. All teenagers with the exception of aberrations & anomalies that is. Cassia has it all ready waiting for her. She's bright and does well in her after school job. She is a talented 'sorter' which is a good sign she will have a good career in the future. And her match is perfect! What could be better than being matched to your very best friend? Well, being matched to someone else entirely different, it seems. Because through-out this book, Cassia is falling beautifully in-love with a world that is against the rules and a boy she could never have. With every page turn, I re-read over and over again certain sentences and paragraphs because they flowed so perfectly. Cassia is such a beautiful character. Not superficially, but deep within her heart. The romance that unfolds is painful and desperate but completely breath-taking. It isn't the sort that is shoved down your throat. Instead it is steady & graceful and progresses in such a wonderful way you can't help but feel your own heart being ripped out at certain points of the story. Go and read this book now! I'm about to start 'Crossed' the second instalment of Condie's trilogy and will be back to report on that as soon as possible. Joli blog, j apprécie bien! Bonne continuation! Je t invite à visiter mon blog: http://faycalt.blogspot.com ! au revoir! I didn't particularly care about this book, but different people, different tastes. New follower. Come visit me as well. What a great review! This book has been sitting on my shelf for awhile now and I've been torn whether or not to give it a shot. I think you have convinced me to start finding some time to fit it in my crazy reading schedule! I received your group message on blogaholics several days ago and wanted to come say hi! I am your newest follower. Feel free to come check out my blog and follow. I have a Giveaway going on over at my blog. You can enter for a chance to win an ebook (pdf format) copy of Emerald City by Alicia K. Leppert. It's a paranormal romance for older teens. Best Wishes and I will be checking back soon! Hi Mia, thank you for stopping by :) I'm now coming your way!